Luke 24:13-35 We Walked With Jesus! So simple, yet so profound! I love this story and Luke is the only one of the four gospel writers who shares it with us. This story doesn’t involve any of Jesus’ called disciples, but two of His followers. We get to know the name of only one of these men, Cleopas, but both were blessed by a personal in depth teaching by their risen Savior. When I Googled this story I noticed a YouTube link for a dramatized version of it. I watched the first two renditions before moving on. In both of the versions the men in the story were fleeing Jerusalem and trying not to be recognized as Jesus’ followers. The second rendition had them planning out what they would say if they were questioned. Their words came pretty close to denying they knew Him, in my opinion. I don’t think that is why these men were on the road at all. From their words I hear that they were indeed followers of Jesus. They were well known to Jesus twelve disciples. They believed He would be the one to redeem Israel. They were heartbroken over the events of the past three days. Most of all, they were confused about all that had happened, including the morning’s report by the women who were at the tomb. We really don’t know when or why they set out from Jerusalem that day. Being it was a seven mile walk, they could have made that distance in a few hours. We know they were present that morning when the women came back and reported what they found. They also heard Peter and John’s report of their findings. We also know that most of the day had elapsed by the time they reached their destination. So they either set out fairly late in the day or their journey with Jesus was slowed way down to allow Him time to finish His explanation of the scriptures. I would expect He needed quite a bit of time to go through ALL the scriptures, concerning Himself, in detail with them. I imagine they were in no hurry as they walked and talked. Jesus expounded on EVERY aspect of the scriptures pertaining to what these men had just witnessed and experienced. Their spirits were responding to Jesus words even though their minds were prevented from grasping the whole truth. I wonder why God did that? Was it because they would have gotten so wrapped up in excitement at seeing Him alive that they wouldn’t have sat still for His teaching? He had SO much that He wanted to impart to them. He wanted them to know “the rest of the story.” And He gave it to them firsthand. I love how He finally revealed Himself to them. In something so simple yet so profound; the breaking of the bread. 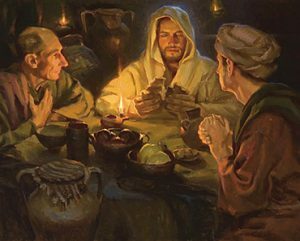 Was it the blessing He prayed, the way He broke the bread, what He said as He handed them the pieces, the nail prints in His hands as He extended them towards them, or a combination of all of them? Was His revelation like peeling the layers of an onion or like breaking an egg; bit by bit or all at once? Their spirits knew it LONG before their minds did. I seriously doubt that these two had any more reservations about Jesus being the Messiah and being risen from the dead. No matter what came their way later on, they had this personal time with Jesus to fall back on. Their lives were changed forever! They couldn’t wait to get back to the group and share the good news. The only thing that would have made it better was if they had brought Jesus back with them personally, but He disappeared right after revealing Himself to them. No matter. They would make SURE the rest of Jesus’ followers believed them and the women’s stories. I’ll leave you here for today. Just wait and see what happens next! Lord Jesus, I would have loved to walk that dusty road with You that day. To have You explain all Your prophecies directly to me. To have my eyes open to the truth in a wonderful new way. No way would I be an expert afterwards but I would be able to see the full pattern You had been weaving throughout history. In that weaving I’m sure You also made it known that there was more to come. You were securing these two disciple’s foundations for what was to come next. NO WAY would the enemy be able to undermine their belief after this. Thank You for giving us so many eyewitness accounts of Your resurrection. You reveal Yourself to me in so many other ways. I haven’t had the pleasure of walking physically with You but my spirit has borne witness to You walking beside me spirit to Spirit. You have touched my life so often and in so many miraculous ways that the enemy has no chance of convincing me otherwise either. Thank You for that certainty. I only wish I could pass it on as easily as these two were able to do. I wish my children saw You as clearly. Give them an Emmaus road experience please Father. I want to see their eyes open with understanding. To hear the excitement in their voice as they share their revelation. Thank You for never giving up on any of us. « Luke 24:1-12 Don’t You Remember?